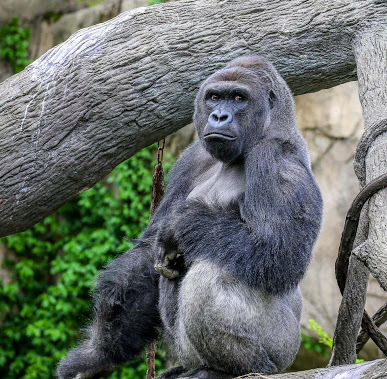 Much discussion has been generated in the last week or so by the footage of a 4-year-old boy in the gorilla enclosure at Cincinnati Zoo and the subsequent killing of Harambe, a 17-year old Western Gorilla silverback. Besides the recriminations against the zoo and the boy’s mother, and questions over whether such animals should even be kept in zoos, many commentators have been weighing up the value of the life of a magnificent beast, which is a member of a group of around 100 000 remaining of his endangered species, against that of a child, representative of his more than 7 billion fellow humans. The discussions are reminiscent of another common hypothetical ‘moral dilemma’: there is a fire in a building which contains an anonymous person and the final remaining copy of the complete works of Shakespeare. You can save only one, which do you choose? A single human life balanced against something which adds value to humanity as a whole. In both of these circumstances, those who chose the animal or work of art over a human life are generally criticised as lacking empathy, verging on the sociopathic. Those expressing the view that a critically endangered animal has more worth to the planet as a whole than one human were met with a barrage of criticism for their lack of humanity. David Bray in The Guardian expressed horror last week that as humans we don’t automatically empathise with the fellow human in these equations. However, the anthropocentric worldview that any human life has more value that any other species or organism within this planet’s ecosystem is what has contributed to our abuse of the Earth’s resources for our own gain, creating a rationalisation of deforestation, overfishing and the continued burning of fossil fuels. As a result of a disregard of humans’ place within a complex web of lifeforms, our overpopulated, warming planet is sliding towards a manmade mass extinction. While the concept of empathy and solidarity with others of our species is indeed ideally how we shouls coexist, it is all very good in theory but generally doesn’t happen in practice. Society makes calls on the differing value of human lives every day. Collateral damage in war and drone attacks, the trade in dangerous products, such as tobacco, for corporate profit and legal systems which sanction the taking of human life in punishment are widely accepted without question as they are seen as protecting our own economic interests and standard of living. Even when it comes to the endangerment of children we find it surprisingly easy to turn a blind eye: there have been an estimated 14 000 child deaths in the Syrian conflict and another 1000 in the past year in Yemen. Last September, the photo of dead 3-year old Syrian refugee Aylan Kurdi on a Turkish beach momentarily pricked our collective conscience but since then over 340 more babies and toddlers have drowned in the Mediterranean. In addition to these examples, many thousands more children are facing malnutrition or being forced into soldiering in conflicts around the world. And that’s only the children. Countless deaths occur as a result of the knowing actions of other humans. Our reaction to these circumstances, and those to the child imperilled at Cincinnati Zoo, highlights the fact that our level of empathy for other humans is inextricably connected to proximity and familiarity. We value more highly the lives of the members of our family, our town and nation and any other groups we belong to or identify with, be they based on ethnicity, sexuality or the sports team we support. In terms of global events our awareness can be heightened by the media (video of the zoo incident or graphic photos of drowned refugees) but very few people can genuinely claim to view all human lives equally and our genocidal, imperialistic, slave-trading, militaristic past (and present) testifies to that. In his piece exhorting the need to value human life over other species, David Bray cites Orwell’s Animal Farm to support the argument that humans are “more equal” than other animals. But Orwell’s original intention was to question humankind’s treatment of its own; that we fool ourselves into believing that we treat all humans equally when this cannot be further from the truth. We tell ourselves that we have, and believe in, universal human rights. However, we clearly don’t value all humans equally so why should it be surprising if we can find more value in animals on the cusp of extinction or works of art that transcend time?